Mysia is the northwestern region of Anatolia located on the shore of the Marmara Sea between Troas and Bithynia. The chief physical features of Mysia are the two mountains, Mount Olympus in the north and Mount Temnus in the south. The most important cities were Pergamon in the valley of the Caïcus, and Cyzicus on the Propontis. The whole sea-coast was studded with Greek towns, several of which were places of considerable importance; thus the northern portion included Parium, Lampsacus and Abydos, and the southern Assos, Adramyttium. 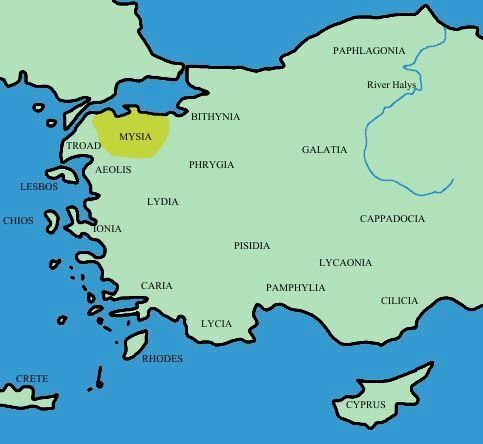 Further south, on the Eleatic Gulf, were Elaea, Myrina and Cyme. Reverse: Victory seated right, holding shield with (XP) inside on column; SALVS REI_PVBLICAE / SMKA? Ref: RIC X 103, SRCV 4241? Reverse: RESTITVTOR ORBIS, Victory, standing right with palm, presenting wreath to Aurelian. (26) City Commemorative 330-333 A.D. Reverse: she-wolf and twins Romulus and Remus, ** above; ?SMK? (32) Constantine II 330-335 A.D. Reverse: GLOR-IA EXERC-ITVS, two soldiers, each holding spear and shield, two standards between them. Reverse: two soldiers standing either side of a standard; GLOR_IA EXERC_ITVS / ?SMK? Reverse: IOVI CONSER-VATORI CAESS, Jupiter leaning on sceptre and holding Victory on globe, wreath to left, officina letter Δ to right. Mintmark SMK. Reverse: trophy; AΘHNAΣ / NIKHΦOPOY, ΠEPΓ ? Reverse: owl standing facing on palm branch, wings open; AΘH_NAΣ / NIKHΦOPOY, monogram ? _ monogram ? Obverse: Head of young Herakles right wearing lion's head. Reverse: ΠEΡ, head of Athena right in crested helmet.